The spot sees the launch of the new Opel Corsa which has more power, more comfort, is more agile and a lot more fun! So we set about driving the idea that the new Corsa range has been rejuvenated to create an exuberating driving experience. Tracey Khan, Producer comments on the project, "Working with Markenfilm was lots of fun. They let us be creative with their animations and designs and allowed us to bring to life the graffiti throughout. It was such a pleasure to work with creative clients that shared our vision right from the start." 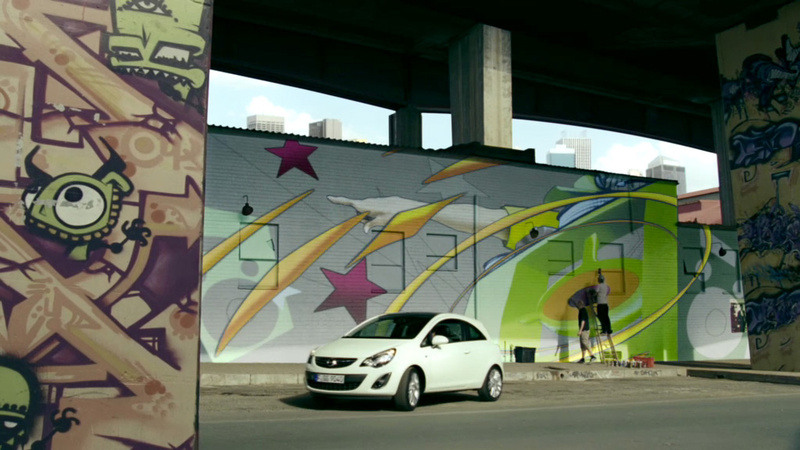 Once the graffiti was animated we had to composite it onto the walls and backgrounds of Johannesburg. Integral to the look Kim envisaged, the graffiti had to look organic and part of the environment. The graffiti could not look like it was projected onto the surfaces and we wanted it to feel like it was alongside the car on its journey. Emma White, one of our Lead 2D artists tells us: "Working alongside the graphic artists and combining the power of Nuke's 3D capabilities, the compositors were able to seamlessly blend the graffiti onto the buildings using traditional projection techniques within Nuke. It was a collaborative and creative process between all parties, which is clearly reflected in this playful spot and was a great project to be a part of!"